Interstate 170 was the planned freeway spur for downtown Baltimore from Interstate 70 to the west. The highway saw construction in the late 1970s in a residential area west of Greene/Paca Streets (Maryland 295). 1.25 miles of the freeway opened amid controversy in 1979. U.S. 40 remained on the parallel frontage streets of Franklin and Mulberry Streets until 1983 when the route overtook the decommissioned Interstate 170. Construction of the freeway hastened the urban blight of the area community, a trend hoped to end with the addition of the proposed Red Line (MARC). The Interstate 170 freeway west of Downtown Baltimore. The I-170 designation was removed when Interstate 70 was formally canceled within the Baltimore city limits. 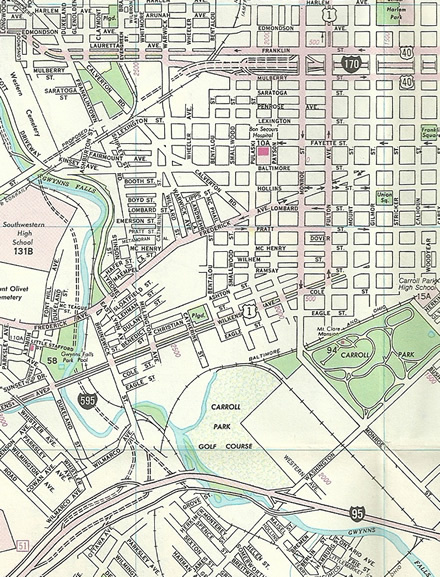 When plans for Interstate 70 through Leakin and Gwynns Falls Park were dropped in 1981, the connection to Interstate 170 was severed. 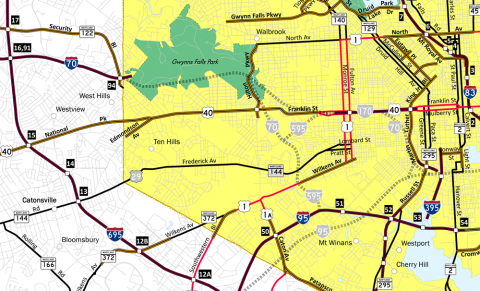 Construction of that freeway was canceled due to the impacts to both Gwynn Falls Park and residential areas to the east. Interstate 170, no longer connecting to its parent, was dropped in favor of a realigned U.S. 40. The Interstate 595 proposal made it to the 1986 Gousha Metropolitan Baltimore folding map. Looking at the western end of the Interstate 170 stub freeway from Pulaski Street. A large mural was painted on the concrete wall that was intended to support unconstructed Interstate 170. Demolition of the freeway stub commenced September 10, 2010. The $2.5-million project razed the unused freeway elements between Pulaski and Monroe Streets. A subsequent $6-million project through summer 2011 constructed two new parking lots for the adjacent MARC West Baltimore station nearby.1 Photos taken 08/27/05, 06/20/12. Looking back to the west at non-existent oncoming traffic on the eastbound roadway of former Interstate 170. Concrete barriers prevent drivers from continuing west to the freeway drop-off at Pulaski Street. This stretch of unused roadway was removed by summer 2011 as part of a $2.5-million project to clear land for an expanded MARC parking lot facility east of Pulaski Street. Photo taken 01/02/01. The freeway travels below grade alongside Mulberry Street (east) and Franklin Street (west). A series of overpasses carry both vehicular and pedestrian traffic above. Photo taken 08/27/05. Traveling east at the Carollton Street pedestrian overpass on U.S. 40. The freeway median remains empty as it represents an unconstructed leg of the Baltimore Metro line. 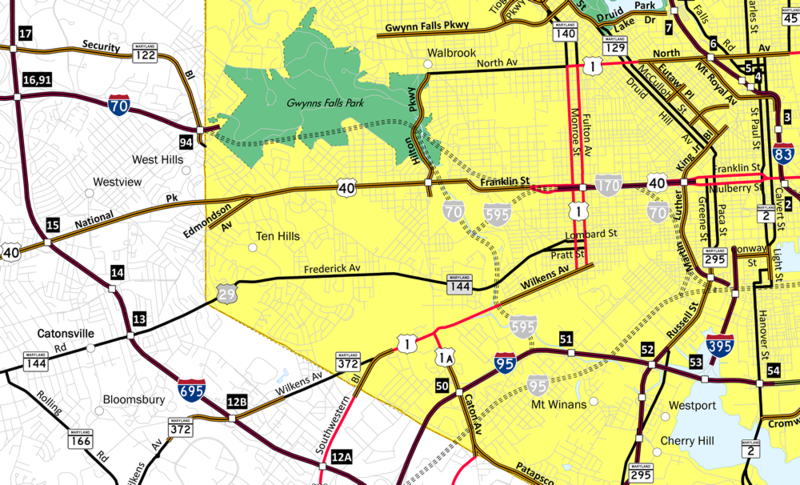 The proposed Red Line of MARC will utilize this corridor if built as envisioned. A 2016-completion date was being touted as of 2011. Photo taken 08/27/05. U.S. 40 approaches the Social Security Building and Greene Street (Maryland 295 south). Photo taken 08/27/05. A "TO U.S. 40" shield assembly stands at the gore point between Franklin Street and the former Interstate 170 freeway beginning. The assembly should read "West U.S. 40". Photo taken 08/27/05. A wide expanse of grass separates the two roadways along the U.S. 40 freeway between Greene Street and Martin Luther King, Jr. Boulevard. Photo taken 06/27/10. Traffic from Martin Luther King, Jr. Boulevard utilizes Franklin Street west to this on-ramp onto the westbound freeway of U.S. 40. Photo taken 06/20/12. A look at the Franklin Street (former U.S. 40 west) intersection with U.S. 1 south (Monroe Street). U.S. 1 northbound follows Fulton Street one block to the east. A button copy overhead looms overhead with a blank sign for "Interstate 170 West." Also visible was the blocked on-ramp to unconstructed I-170 westbound from Franklin Street and U.S. 1. Photo taken 01/02/01. Looking westward from the Monroe Street (U.S. 1 south) overpass at the freeway end and a portion of the right of way reserved for Interstate 170. This section of abandoned roadway was removed by summer 2011. This included the on-ramp to I-170 west from U.S. 1. Photo taken 01/02/01. Second photo taken 06/27/10. Third photo taken 06/20/12. Eastbound on Mulberry Street (former U.S. 40 east) at what was the partially built off-ramp from unconstructed Interstate 170 eastbound to U.S. 1 (Monroe Street & Fulton Avenue). A sign bridge was hastily installed to display directions for traffic to U.S. 1. Results of the 2010-11 demolition of unused freeway west of Fulton Avenue removed the majority of this ramp. Photo taken 10/14/01. Second photo taken 06/20/12. Button copy overheads posted above Mulberry Street east direct traffic to U.S. 1 from U.S. 40 east. These were intended for the freeway off-ramp of Interstate 170. Photos taken 06/20/12. Mulberry Street parallels the eastbound lanes of U.S. 40 (former Interstate 70) between the on-ramp at Monroe Street and off-ramp ahead of Greene Street. Mulberry Street intersects U.S. 1 southbound (Monroe Street) at a signalized intersection and proceeds one block to the signal at U.S. 1 northbound (Fulton Avenue). Photo taken 06/20/12. Continuing eastward on Mulberry Street between U.S. 1 north (Fulton Street) and Mount Street. Older row homes, most of which are in a neglected or vandalized state, front both Mulberry and Franklin Streets above the below grade freeway. Photo taken 06/20/12. Eastbound at the intersection with Gilmor Street, one block after Mount Street. Photo taken 06/20/12. Mulberry Street east at Carey Street. Photo taken 06/20/12. Mulberry Street eastbound at Carrollton Avenue. Stricker Street and Carrollton Avenue are discontinuous due to the Interstate 170 freeway. Pedestrian overpasses cross above the freeway between the separate sections. Photo taken 06/27/10. Arlington Avenue flows northward from Saratoga Street one block to intersect Mulberry Street en route to Fremont Avenue and Pitcher Street. Photo taken 06/20/12. Mulberry Street east at Schroeder Street. The former Interstate 170 freeway emerges ahead to pass over Martin Luther King, Jr. Boulevard as Mulberry Street descends to intersect the six-lane boulevard below. Photo taken 06/20/12. Button copy overheads above the I-170 freeway at the MLK Boulevard off-ramp. U.S. 40 remains on the freeway eastward to Orleans Street at St. Paul Place, north of Downtown Baltimore. Photo taken 10/10/04. Traffic from U.S. 40 eastbound merges onto Mulberry Street ahead of Martin Luther King, Jr. Boulevard (Biddle Street). Martin Luther King, Jr. Boulevard loops west of Downtown Baltimore between Chase Street and the western branch of I-395. The boulevard north connects US 40 with the Mount Vernon neighborhood. Photo taken 06/20/12. Mulberry Street eastbound at Martin Luther King, Jr. Boulevard. The six-lane arterial intersects Lombard & Pratt Streets just west of the central business district. From there the boulevard continues to Camden Yards and directly onto the southbound beginning of Interstate 395. Mulberry Street continues east with U.S. 40 to Orleans Street near I-83. Photo taken 06/20/12. A look at the Franklin Street on-ramp to U.S. 40 from just west of Martin Luther King, Jr. Boulevard. The overhead originally displayed "Interstate 170 west". Photo taken 06/20/12. An overhead for U.S. 1 (Monroe Street) south and the unopened on-ramp to Interstate 170 westbound along Franklin Street west. U.S. 40 was to remain on Franklin and Mulberry Streets and continue west to Edmondson Avenue as Interstate 170 veered southwest to meet I-70 at Gwynns Falls Park. Photo taken 06/27/10. The stub end of the Interstate 170 freeway, the partially completed on-ramp, an empty sign bridge and light posts installed in 1979 appeared beyond Monroe Street. Demolition of the unused roadway west of Monroe Street commenced in September 2010. Photo taken 10/13/04. The U.S. 1 on-ramp via Franklin Street crosses over the U.S. 40 westbound off-ramp from former Interstate 170. Photo taken 10/13/04. U.S. 40 and Franklin Street converge at the intersection with Pulaski Street two blocks west of U.S. 1 (Monroe Street) south. A concrete barrier separated traffic from the merging U.S. 40 and Franklin Street. Photo taken 10/13/04. Martin Luther King, Jr. Boulevard acts as a connector between the western branch of Interstate 395 and U.S. 40 (Franklin & Mulberry Streets), providing a through route around the western edge of downtown. This picture shows the boulevard as it approaches U.S. 40, which is former Interstate 170. Photo taken 05/31/04. Button copy signage on Martin Luther King, Jr. Boulevard northbound approaching the former Interstate 170 freeway. Notice that an imprint was still evident from when this sign actually did display Interstate 170. Interstate 170 was signed between 1979 and 1983. Photo taken 10/14/01. Second photo taken 05/31/04. U.S. 40 returns to Mulberry Street from the I-170 freeway just east of Martin Luther King, Jr. Boulevard. Photo taken 05/31/04. A second sign relic remained with an imprint from a removed Interstate 170 shield at the left turn onto Franklin Street west from Martin Luther King, Jr. Boulevard north. Photo taken 10/14/01. Second photo taken 06/20/12. U.S. 40 trailblazer posted at the left turn onto Franklin Street. The freeway on-ramp is nearby. Photo taken 06/20/12. "'Highway to Nowhere' heads to the dump." The Baltimore Sun, September 10, 2010. Interstate 170 (Maryland) @ Wikipedia.org.